← THIRD QUARTER MEETING – OCTOBER 5th ! At 8:30AM Thursday, December 10, 2015 Buckeye DAMA is excited to present Ralph Hughes, author of Agile Data Warehousing and his most recent book, Agile Data Warehousing for the Enterprise. Ralph is a world-renowned leader, TDWI speaker and consultant in the field of data warehousing. We are delighted to bring him in to speak to you. Seating will be limited so please RSVP well in advance. If you do not already have a membership (individual or corporate), please review this Membership Options page. Non-members may attend their first meeting at no-charge as long as identification is presented at registration. OVERVIEW – Agile practices burst onto the scene fifteen years ago. Since then, industry has seen wide adoption in Application Development. We now have mature, agile based tools for app dev project management tools, requirements management and SDLC. Business Intelligence, however, had lagged behind in both tools and methodology. Ralph Hughes changed that for data warehousing and he’s doing it again for Big Data. Join us to learn how you can apply agile principles to both of these highly relevant solutions. TOPIC – During this event Ralph Hughes will provide an overview of the strategies and tools that can make a company’s data warehouse and Big Data projects deliver higher value in a shorter time with far less risk. It is no surprise that pundits are suggesting that inflated expectations for big data have slid into the trough of disillusionment, when one realizes that half of big data projects proceed without a guiding business plan. In this presentation, one of the world’s experts on enterprise business analytics will assemble the ingredients that made incremental and iterative development succeed for enterprise data warehousing into a recipe for fast ROI on big data projects. We’ll discuss the poly-structured data processing tools available today and assess the BI use cases where they fit best. Next, we will describe how to employ just-enough requirements and progressive solution architectures to drive the risk out of our big data projects. Finally, we will wrap this new approach with a test-led development strategy that makes big data projects transparent, predictable, and low risk. The result will be a recipe for your next big data project that ensures fast delivery and highly valued results without the risk of dead ends or wasted programming. >> The agile development value cycle for traditional data warehousing. >> The agile development value cycle adapted for big data projects. >> Appropriate targets for M/R, Spark, graph models, and document database technologies. >> Escaping the trap of the “big, scary hardware platform up-front”. >> Visualizing goals and progress with nightly regression testing and QA automation engines. SPEAKER BIO – Ralph Hughes serves as Chief Systems Architect for Ceregenics, a Denver data analytics consulting firm. He has been building data warehouses since the mid-1980s, starting with mainframe computers, and has led numerous BI programs and projects for Fortune 500 companies in aerospace, telecom, government, and life sciences. 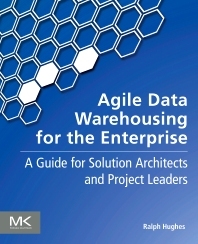 He authored the industry’s first book agile data management, and his third book, “Agile Data Warehousing for the Enterprise,” was just released in October 2015. Ralph is a faculty member at The Data Warehousing Institute, a certified Scrum Master, PMI Project Management Professional, and has coached over 1,200 BI professionals worldwide in the discipline of incremental and iterative delivery of large data management systems. Ralph holds BA and MA degrees from Stanford University in computer modeling and econometric forecasting. How do I rsvp? I am a member and I have wordpress.com account but still I don’t see a link on the page to rsvp. Sorry the RSVP link isn’t available here yet. You can RSVP right now on Meetup.com.